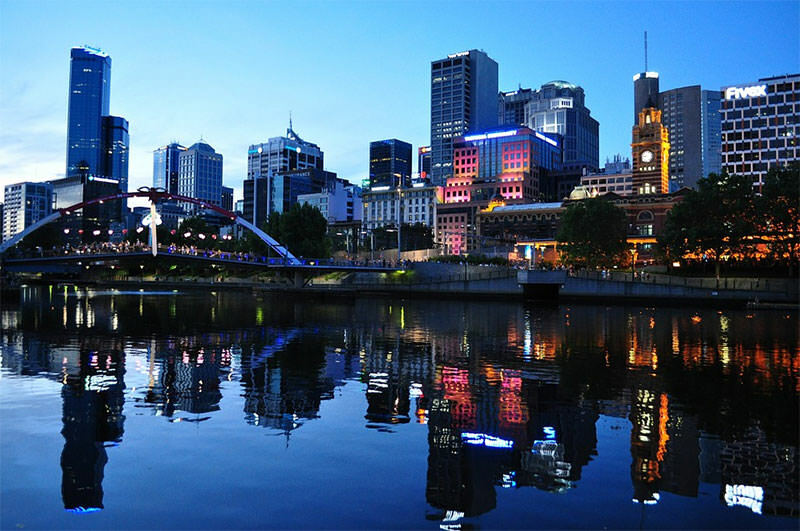 The warm, beautiful and welcoming city of Melbourne takes pride in being the live music capital of Australia—a city in which it is possible to hear a variety of musical genres and styles every single night of the week. Despite the recent high profile closure of one of Melbourne’s most popular music venues—the Bourke Street Palace Theater—Melbourne is still home to scores of great places to watch a great live show. From “dive-y” basement bars to large arenas and everything in between, the city will simply amaze you with the many opportunities for musical fun it offers. And best of all, the music you are likely to hear, ranging from large mainstream and punk rock shows, to indie bands and world-class hip-hop acts, is equally as diverse. In the following piece we will highlight several of the most popular live music venues in Melbourne, including a brief description of each venue and the types of musical acts that normally perform there. If you were to glance at any list detailing the “best live music venues in Melbourne,” chances are you would see the name Corner Hotel more than a few times. That’s because this venue is one of the most popular in the city, not just for the great music to be heard here, but also for the whole package: acoustics, seating, décor, drinks and tasty internationally-themed grub. The iconic mid-sized Corner Hotel, with its awesome sound, has played host to groups including Blink-182 and U2, as well as a whole host of popular Australian up-and-comers; acts such as Paul Kelly and “You Am I.” The pub is also renowned as the place where the Living End band “chose to play an incredible 11 shows—all sold out—on their retro tour in 2012,” and where the now popular Lourde performed a few intimate shows to popularize and celebrate the release of her album, Pure Heroin. In addition to the great music at the Corner Hotel, the club also serves up some tasty pub-style grub, wonderful cocktails and plenty of hospitality. And if you happen to be there on a Thursday night, be sure to check out the club’s rooftop trivia contest, which allows the bustling crowd of patrons to compete against each other for a variety of prizes. Located in the Brunswick area of Australia, Howler is a club that seemed to pop up overnight from what was left of a rundown shack along the train line. Today it holds the distinction of being the club that led to a whole new wave of popular music venues in the Brunswick region, of which the Howler is definitely the most popular. The Howler has been booking great acts for over a decade now, in a club that has a rustic feel and really big sound. The stage area of the Howler is located out back, so patrons will initially need to walk through an indoor/outdoor room in which the fully-stocked bar is located—making it one of the most unique bar settings you could possibly imagine. This is where the DJ will likely be spinning tunes on those nights when live music is not played. Out back, the Howler features live music from both local and international performers in a variety of genres and musical styles. Located at 7-11 Dawson Street in Brunswick, the Howler is definitely worth checking out on your next trip to Melbourne. If you find yourself in the Chinatown region of Melbourne, be sure to stop in to the club known as Section 8 for some wonderful beer and ales, great wine and signature cocktails. Located at 27-29 Tattersalls Lane, the Section 8 pub consists of an old shipping container, with seating made of wood pallets. The bar, which is as rustic as rustic can be, is both charming and intimate, not to mention being a great place to catch an afternoon set from one of Australia’s emerging bands. Over the years, Section 8 has hosted everything from dance battles (to the sounds of their in-house DJ) to block parties; and the music here never disappoints. Even if you’re just parched from the noonday sun and looking to quench your thirst will a tall pint, you will always have great, floor-rattling music as a backdrop in this very unique club. If you’re looking for a high-energy, even frenzied club atmosphere, the Prince Band Room is definitely worth checking out. From the moment you walk through the doors you are sure to become immersed in the bar’s electric atmosphere and friendly, welcoming vibe. The club is immense and wide open, with the bandstand/stage area located near the back. This floor plan, with its exposed dimensions, have been known to give rise to more than one mosh pit over the years, as punk rock and indie bands share their art form over the blaring sound system. The drinks at the Prince Band Room are generously poured and very reasonable in comparison to some of the downtown clubs, and the bar staff and servers are always happy to welcome a new face. Live music happens at least once a week at the club, and because most of the crowd is of the millennial age, the admission prices are generally low—and sometimes free. Although most of the musical talent can best be described as “up-and-comers,” the Prince Band Room does book its share of big name bands, as it has the capacity to host such events. Much like the Corner Hotel, the Esplanade Hotel, or Espy as it is familiarly known, is one of the most emblematic music venues in the city of Melbourne. With a view overlooking the beaches at St. Kilda, the bar is one of the most picturesque and aesthetic pleasing settings in the city, and a great place to catch a live show. Gigs here are held almost every night of the week in the facility’s many band rooms, with the bigger name bands typically scheduled on the weekends. The drinks at the Espy are always cold and refreshing, and the kitchen cranks out some of the best snacks you ever tasted.